– zOMG “new” revolutionary training ideas!! – | I'mma freak for popping. So, you can tell from my last post I’ve been looking into ways on how to improve the physical aspect of my dancing. Recently I’ve been researching isometric exercise. It’s really nothing new – but for those not in the know it’s a set of exercises that do not change joint angle and muscle length. Basically isometrics are done statically, instead of dynamically or through a range of motion. 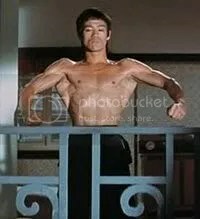 Bruce was famous for pioneering different training disciplines and also a well-known practitioner of isometrics. What’s interesting is that it has been round for millennia – you can see it in yoga and kung fu exercises, and in the early 20th century a book was written by a Dr A.K. Anokhin describing a set of exercises that instructed one to deliberately tense the muscles in the body as if overcoming resistance; to increase strength and “the ability to tense and relax separate muscle groups.” Perfect for training hits!